Patient Account Representative executes various tasks related to patient account in hospitals and clinics. Typical job duties for these representatives incorporated in the Patient Account Representative Resume include – processing claims, collecting payments, resolving issues related to repayment terms, recording and tracking patients who are delinquent in bill payments, contacting insurance companies for claims, updating patient account information, providing basic administrative tasks related to patient account, monitoring overdue accounts, arranging for debt repayment, establishing repayment schedule and updating patient database. 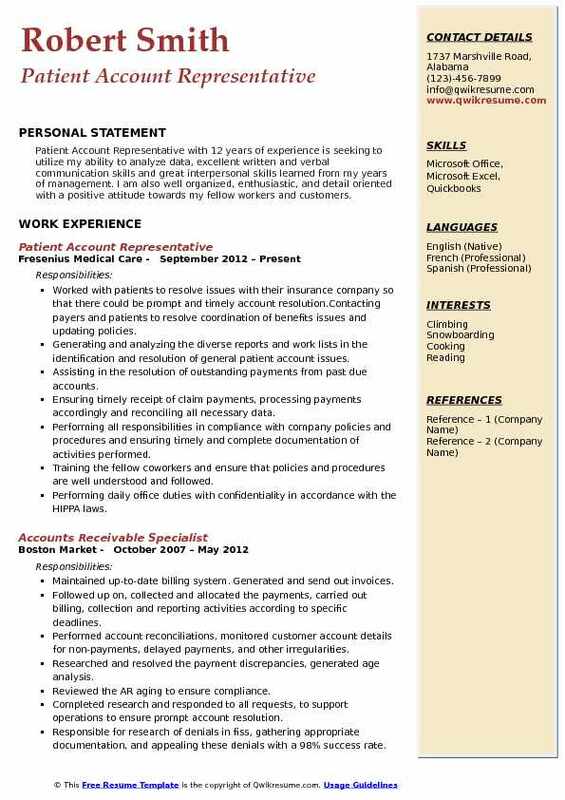 Most employers prefer their patient account representative to possess certain specific skills such as – knowledge of computer software and applications, outstanding verbal and communication skills, proficiency in math and fluency in medical terminologies. Most of the eligible candidates applying for this job role either depict a high school diploma with experience in medical billing and collections, while some candidates embrace an associate’s degree. Summary : Patient Account Representative I with 13 years of experience, experience supporting 10 physicians in a busy medical office. Expertise includes verifying insurance coverage, records reviews, and schedule maintenance. inpatient and outpatient record coding specialist with ICD-9, ICD-10, and coding expertise. Familiar with commercial and private insurance carriers. Seeks a position of increased responsibility and authority. Completed appeals and filled and submitted claims. Submitted refund requests for claims paid in error. Posted charges, payments, and adjustments. Confirmed patient information, collected copays and verified insurance. 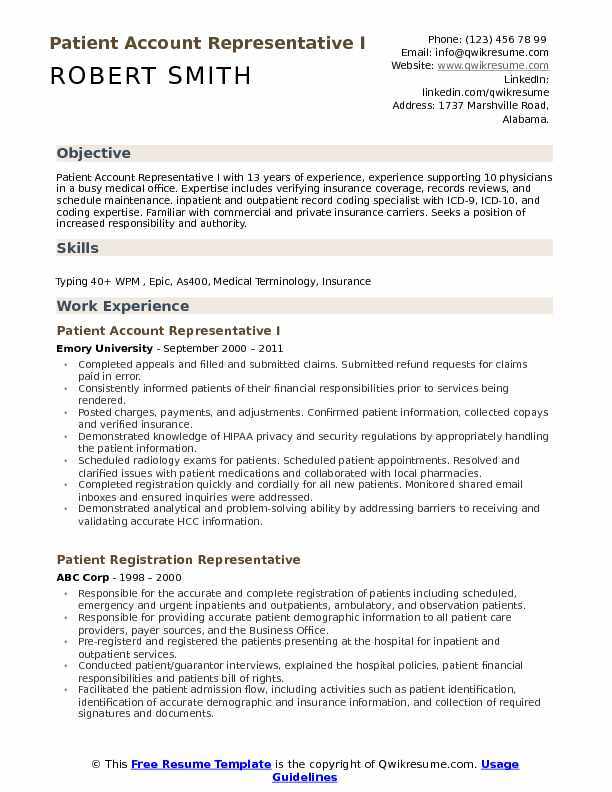 Demonstrated knowledge of HIPAA privacy and security regulations by appropriately handling the patient information. Scheduled radiology exams for patients. Scheduled patient appointments. Resolved and clarified issues with patient medications and collaborated with local pharmacies. Completed registration quickly and cordially for all new patients. Monitored shared email inboxes and ensured inquiries were addressed. Demonstrated analytical and problem-solving ability by addressing barriers to receiving and validating accurate HCC information. Assigned additional diagnosis codes based on specific clinical findings (laboratory radiology and, pathology reports as well as clinical studies) in support of existing diagnoses. Arranged and assisted with hospital admissions. Accurately entered procedure codes, diagnosis codes and patient information into the billing software. 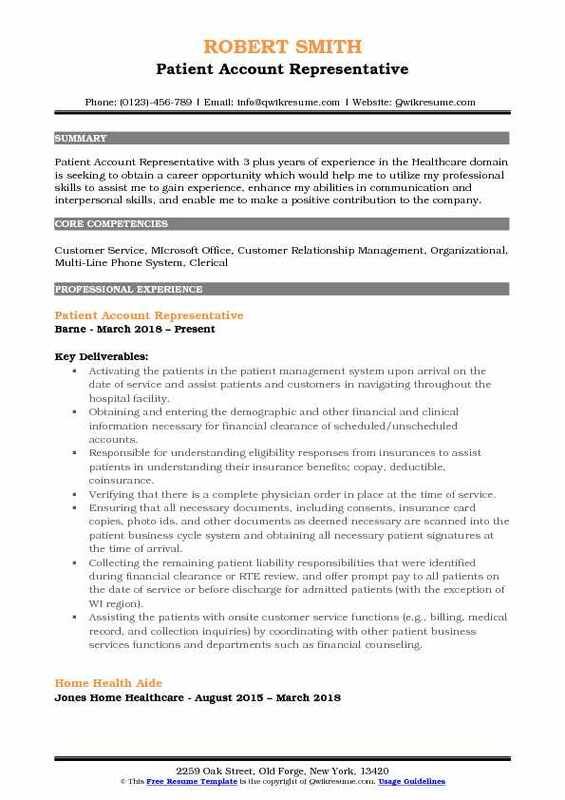 Summary : Patient Account Representative III with 20 years of experience in the Healthcare domain. I would like to continue to make a difference in the Health Care Services industry as a Patient Advocate and employ my years of experience along with Spanish/English bilingual skills. Worked at various hospitals such as Crescent City, Palm Springs, Turlock and Sacramento. Met with both patients and their families on a daily basis in a hospital setting to assist in providing and qualifying them for the maximum benefits possible. Completed applications for state and federal programs (including medi-cal, county medical assistance program, medi-care, state disability insurance). Answered heavy phone calls, scheduling application appointments, patient eligibility status, acted as the patient advocate. Followed-up with patient and state agencys gathering information that may be lacking for patient approval. Upon receiving patient eligibility, billed and updated to facility and company for payment. Established and gained the rapport with both hospital employees and all patients. Handled personal, financial and medical information per company policy and HIPPA regulations. Assisted in training of new representatives and was the go-to by hospital staff with inquiries of unusual cases. Reviewed the hospital census to identify self-pay patients on a daily basis. Informed the designated hospital availability of assistance for each patient in a timely manner. Documented which out-patient accounts are accepted in the hospital system. Objective : Productive and accountable Patient Account Representative with less than a year experience, with diverse work history, hands-on skill sets and highly developed customer-service skills poised to parlay comprehensive medical education into career-advancement opportunities. Responsible for all aspects of follow up and collections, including making telephone calls, accessing payer websites. Accurately and thoroughly documented the pertinent collection activity performed. Reviewed the account information and necessary system applications to determine the next appropriate work activity. Verified the claims adjudication utilizing appropriate resources and applications. Initiated the telephone or letter contact with patients to obtain additional information as needed. Performed the appropriate billing functions, including manual re-bills as well as electronic submission to payers. Edited the claims to meet and satisfy billing compliance guidelines for electronic submission. Managed and maintained the desk inventory, completed reports, and resolved high priority and aged inventory. Participated and attended meetings, training seminars, and in-services to develop job knowledge. Participated in the monthly, quarterly and annual performance evaluation process with the supervisor. Communicated issues to the Management, including payer, system or escalated account issues. 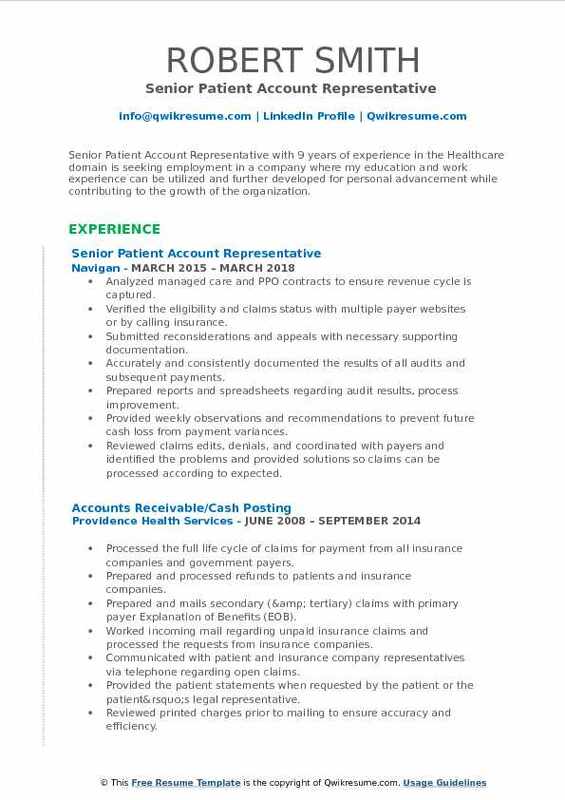 Summary : Senior Patient Account Representative with 9 years of experience in the Healthcare domain is seeking employment in a company where my education and work experience can be utilized and further developed for personal advancement while contributing to the growth of the organization. Analyzed managed care and PPO contracts to ensure revenue cycle is captured. Verified the eligibility and claims status with multiple payer websites or by calling insurance. Submitted reconsiderations and appeals with necessary supporting documentation. Accurately and consistently documented the results of all audits and subsequent payments. Prepared reports and spreadsheets regarding audit results, process improvement. Provided weekly observations and recommendations to prevent future cash loss from payment variances. Reviewed claims edits, denials, and coordinated with payers and identified the problems and provided solutions so claims can be processed according to expected. Verified the eligibility and claim status by accessing payer website and/or calling insurance. Updated coverage, bill appropriate payers, primary and secondary as needed. Interpreted the information on EOBS, RAS, and denials to ensure that claims are processed. 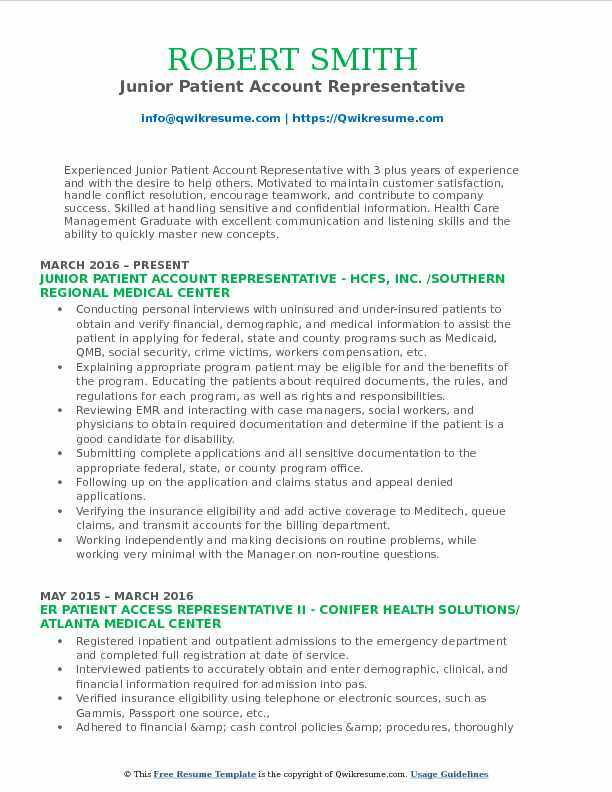 Headline : Highly motivated and results-driven Patient Account Representative with 5 years of experience in the Healthcare domain with demonstrated ability to successfully align comprehensive skills and talents to achieve daily goals and objectives. Strong interpersonal skills and proficient in fostering positive professional relationships and communicating effectively at all levels. Seeking to utilize the experience and strong work ethic in an organization valuing dedication and results. Responsible for ar on the Alpha split, for commercial, non-commercial, government, MCO and workers comp payers, excluding Medicare and mass health. This includes submitting clean claims, following up with primary and secondary insurance until all insurance on the account has a $0 balance. Quickly navigating through Soarian Financials and Epic along with several other applications used by UMass memorial in order to obtain any and all information needed to resolve accounts. Utilizing the payer websites to assist with eligibility, claim status, and file appeals when possible. Assisting on projects to help define issues with certain payers. Attending the prayer meetings to communicate issues to our provider reps and discussing resolutions. Completed several cleanup projects involving credits and adjustments for the epic transition. Continued to provide training to a 3rd party billing company who has taken over open Soarian accounts. Posting zero pay remits, denials, payer/administration, write-offs, transferring balances to the responsible party or assigning to appropriate work lists for corrections, clinical appeals or further resolution. Reviewing accounts with credit balance to determine whether true or false and assigning to appropriate worklist for resolution. Obtaining updates on payer guidelines to determine if an update will require a need for a change in our process. Submitting to the billing analyst for review, if neccessary. 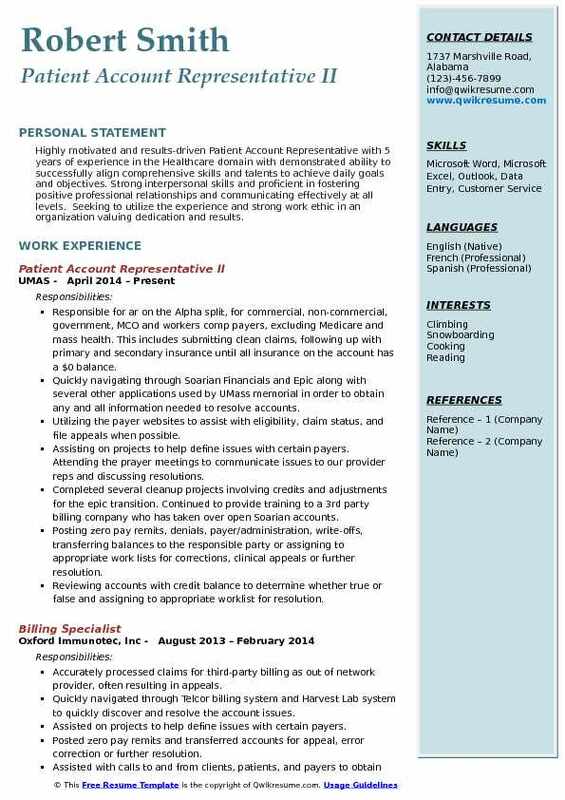 Headline : Patient Account Representative, very detail oriented with strong billing and coding skills of 6 years experience with Medicare, Medicaid, Commercial, Government, and Workers Compensation Work well in a busy office handling a wide variety of tasks Highly reliable self-starter, work well without supervision. 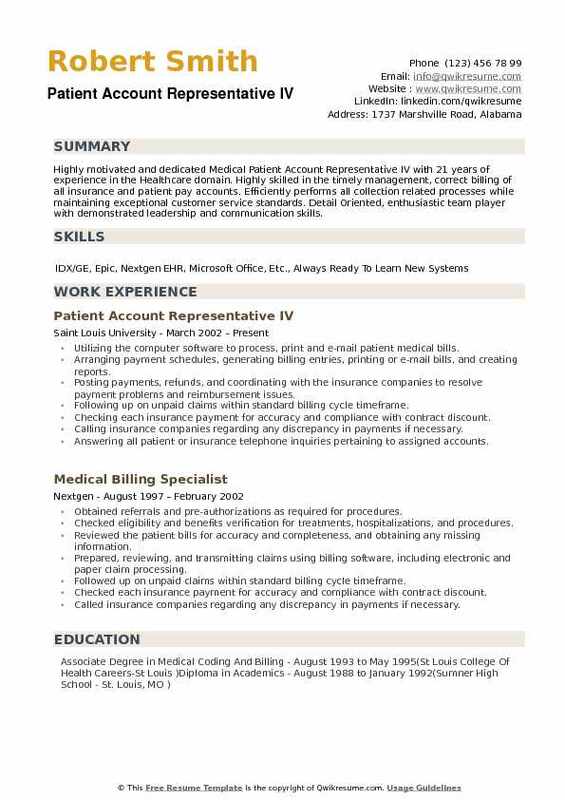 Responsible for reviewing Medicare insurance aging reports, resubmitting claims on paper, as well as on Medicare DDE, working corrected claims and/or appeals and contacting Medicare to ensure maximum reimbursement in a timely manner knowledge of LCD/NCD for infusion pharmacy and radiology claims. Researched and appealed the rejected claims and applied the appropriate adjustments. Monitored the assigned denials and proactively identified, researched and proposed solutions to trends. Ensured proactive cash flow by maximizing reimbursement and reducing accounts receivable. Managed and continually improved the information tools and facilitated an understanding of the tools used by the client service managers. Assisted the client service management in preparing for regular revenue cycle performance reviews. Assisted in implementing process improvement shortfalls in the revenue cycle. Worked closely with client service management and reported developers to continually assess and streamline physician reporting, focusing on improving the organization's ability to communicate performance and drive continuous cycle improvements. Maintained a thorough understanding of current system application and industry best practices. 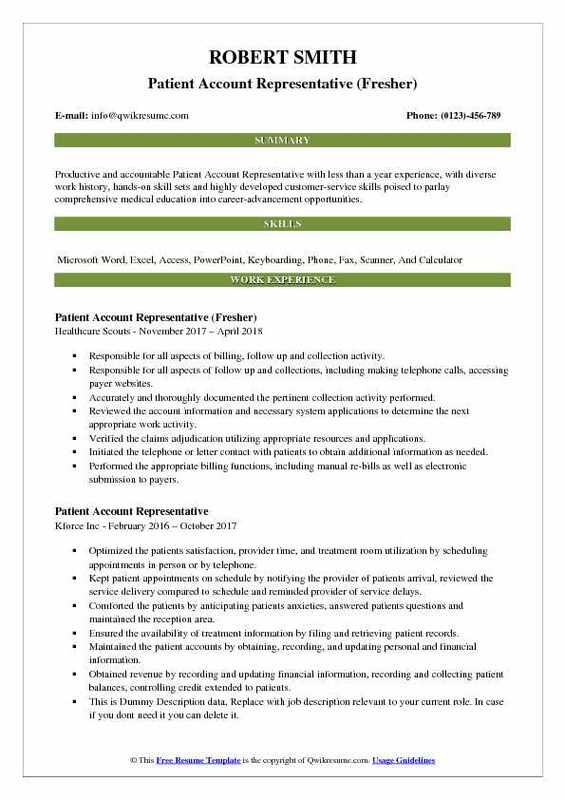 Objective : Experienced Junior Patient Account Representative with 3 plus years of experience and with the desire to help others. Motivated to maintain customer satisfaction, handle conflict resolution, encourage teamwork, and contribute to company success. Skilled at handling sensitive and confidential information. Health Care Management Graduate with excellent communication and listening skills and the ability to quickly master new concepts. Skills : 40 WPM, Cerner., Excel, Meditech, Passport, MS Word, MS Outlook, MS Excel, MS PowerPoint, MS Access. Conducting personal interviews with uninsured and under-insured patients to obtain and verify financial, demographic, and medical information to assist the patient in applying for federal, state and county programs such as Medicaid, QMB, social security, crime victims, workers compensation, etc. Explaining appropriate program patient may be eligible for and the benefits of the program. Educating the patients about required documents, the rules, and regulations for each program, as well as rights and responsibilities. Reviewing EMR and interacting with case managers, social workers, and physicians to obtain required documentation and determine if the patient is a good candidate for disability. Submitting complete applications and all sensitive documentation to the appropriate federal, state, or county program office. Following up on the application and claims status and appeal denied applications. Verifying the insurance eligibility and add active coverage to Meditech, queue claims, and transmit accounts for the billing department. Working independently and making decisions on routine problems, while working very minimal with the Manager on non-routine questions. 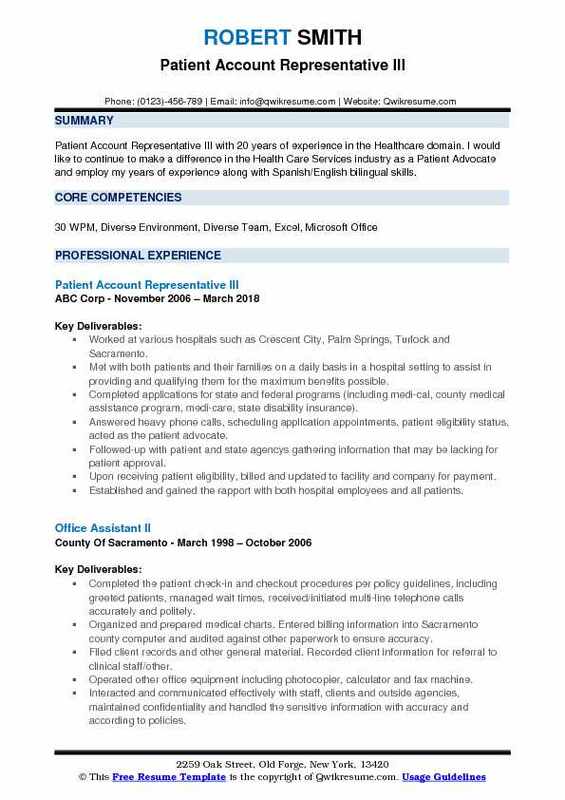 Objective : Patient Account Representative with 3 plus years of experience in the Healthcare domain is seeking to obtain a career opportunity which would help me to utilize my professional skills to assist me to gain experience, enhance my abilities in communication and interpersonal skills, and enable me to make a positive contribution to the company. Activating the patients in the patient management system upon arrival on the date of service and assist patients and customers in navigating throughout the hospital facility. Obtaining and entering the demographic and other financial and clinical information necessary for financial clearance of scheduled/unscheduled accounts. Responsible for understanding eligibility responses from insurances to assist patients in understanding their insurance benefits; copay, deductible, coinsurance. Verifying that there is a complete physician order in place at the time of service. Ensuring that all necessary documents, including consents, insurance card copies, photo ids, and other documents as deemed necessary are scanned into the patient business cycle system and obtaining all necessary patient signatures at the time of arrival. Collecting the remaining patient liability responsibilities that were identified during financial clearance or RTE review, and offer prompt pay to all patients on the date of service or before discharge for admitted patients (with the exception of WI region). Assisting the patients with onsite customer service functions (e.g., billing, medical record, and collection inquiries) by coordinating with other patient business services functions and departments such as financial counseling. 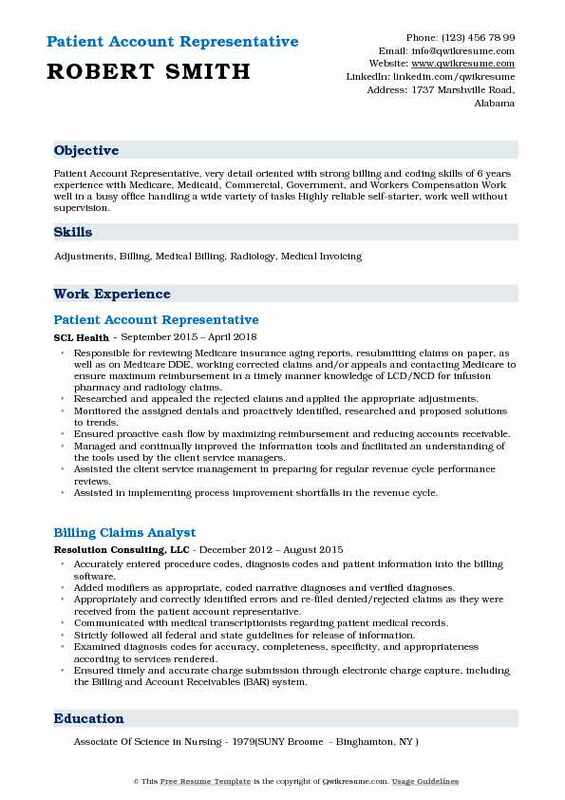 Summary : Patient Account Representative with 12 years of experience is seeking to utilize my ability to analyze data, excellent written and verbal communication skills and great interpersonal skills learned from my years of management. I am also well organized, enthusiastic, and detail oriented with a positive attitude towards my fellow workers and customers. Worked with patients to resolve issues with their insurance company so that there could be prompt and timely account resolution. Contacting payers and patients to resolve coordination of benefits issues and updating policies. Generating and analyzing the diverse reports and work lists in the identification and resolution of general patient account issues. Assisting in the resolution of outstanding payments from past due accounts. Ensuring timely receipt of claim payments, processing payments accordingly and reconciling all necessary data. Performing all responsibilities in compliance with company policies and procedures and ensuring timely and complete documentation of activities performed. Training the fellow coworkers and ensure that policies and procedures are well understood and followed. Performing daily office duties with confidentiality in accordance with the HIPPA laws. Obtaining the pertinent and accurate insurance information and updating in systems for billing purposes. Summary : Highly motivated and dedicated Medical Patient Account Representative IV with 21 years of experience in the Healthcare domain. Highly skilled in the timely management, correct billing of all insurance and patient pay accounts. Efficiently performs all collection related processes while maintaining exceptional customer service standards. Detail Oriented, enthusiastic team player with demonstrated leadership and communication skills. Utilizing the computer software to process, print and e-mail patient medical bills. Arranging payment schedules, generating billing entries, printing or e-mail bills, and creating reports. Posting payments, refunds, and coordinating with the insurance companies to resolve payment problems and reimbursement issues. Calling insurance companies regarding any discrepancy in payments if necessary. Responding to requests and questions from hospitals, patients, and referring physician offices. Calling insurance and patients to obtain additional information needed to process claims. Correcting and updating the insurance information when needed using the epic computer program. Reviewing and resolving all third-party correspondence received from insurance carriers.